Multicade boards have become quite popular over the last few years. Many of you have probably even thought about installing a multicade board in an arcade cabinet you currently own. Unfortunately, installing a multicade board in most classic arcade cabinets can be quite a hassle. Wiring/Rewiring harnesses and installing power supplies can significantly change the inside of your cabinet hampering the possibility of ever returning your classic cabinet back to the game it once was. 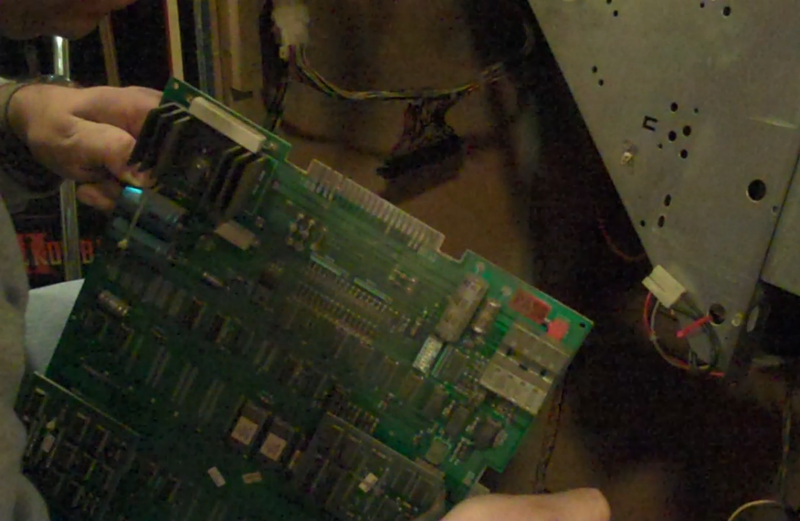 In this post, we will discuss how to install a multicade upgrade kit in your Pac Man/Ms. Pac Man cabinet that will keep the inside of your cabinet mostly intact. In order to perform our upgrade, we will be using the Pacman/Ms Pacman Upright Cabinet 60-in-1 Upgrade Complete Kit available from JammaBoards.com. 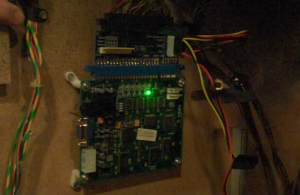 This kit includes a new 60-in-1 classic vertical board, a JAMMA PCB to Pac Man/Ms. Pac Man cabinet adapter, an ATX switching power supply and a set of 4 PCB mounting feet. Let’s take a moment to talk about each of the parts in our kit. There are many multicade boards available right now but the most popular variant is currently the 60-in-1 classic vertical board. This board goes by many different names such as iCade, classic multigame, etc. The biggest reason why this board is so popular is because it plays a good variety of games including Pac Man, Ms. Pac Man, Galaga, Donkey Kong and many others. For a complete listing of games this board plays, please visit the JammaBoards.com website. The JAMMA PCB to Pac Man/Ms. Pac Man cabinet adapter is included to allow us to hook up the 60-in-1 classic vertical board (which is JAMMA) to our existing Pac Man/Ms. Pac Man cabinet wiring. The ATX switching power supply is included to provide power to the 60-in-1 classic vertical board via the included adapter. While this power supply is really overkill for our project, it should ensure that the game is receiving the correct voltage at all times. The PCB mounting feet are included to make mounting our 60-in-1 classic vertical board a simple and easy process. Once we have received our kit, we can begin the installation process. Our first step is to remove the board that is currently in our cabinet. 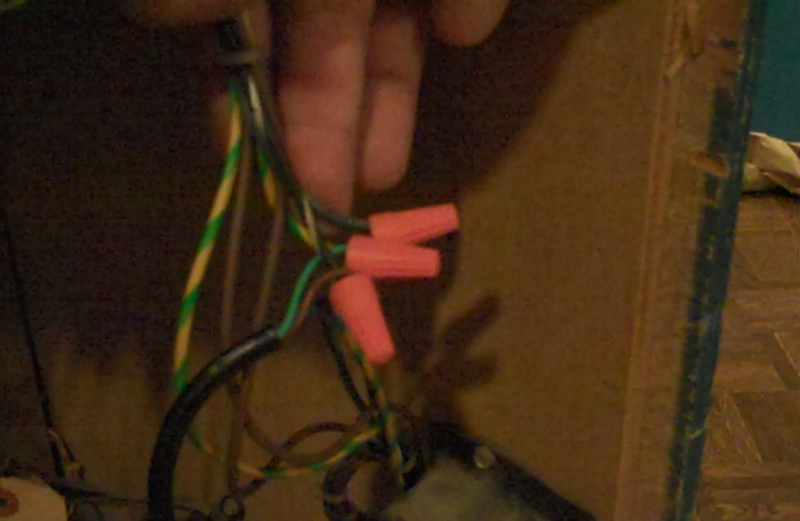 Before we begin the removal process, we recommend unhooking the cabinet harness connector from the board. This prevents the board from contorting the cabinet wiring should it get jostled while we are removing the board. With the harness connector unhooked, start off by removing the plastic holder that is holding the board with a screwdriver or nutdriver. You should only need to remove the holder that is facing the back of the cabinet. With the plastic holder removed, you should be able to remove the board from the cabinet. Please keep in mind that you will also need to remove the daughter card panel from the cabinet if you are installing the upgrade kit in a Ms. Pac Man arcade game. Now that we’ve removed the original board, we can now begin the upgrade process. Start off by mounting the 60-in-1 classic vertical board using the included PCB mounting feet. It needs to be mounted where the JAMMA cabinet adapter can be easily hooked to the wiring harness without putting unnecessary pressure on the cabinet wiring. We recommend hooking up the JAMMA cabinet adapter to the 60-in-1 classic vertical board and then hooking it up to your wiring harness to see where the board can comfortably be mounted. With the board mounted, we can start the process of mounting and connecting our ATX power supply. 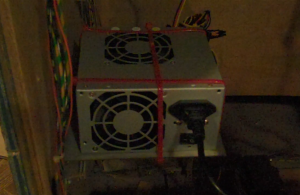 It should be noted that this power supply has already been modified to come on once it receives power. Most ATX power supplies are not set up to do this so don’t expect to use a regular ATX power supply in an arcade cabinet unless you are familiar with how to accomplish this. In our setup, we used the Ms. Pac Man daughter card bracket and mounted it just below our 60-in-1 classic vertical board. We then attached the ATX power supply to the daughter card bracket using standard zip ties. While this method is kind of crude, it accomplishes the job by using the parts that are available to you in the cabinet. Make sure that you attach one of the 4-pin connectors to the JAMMA PCB to Pac Man/Ms. Pac Man cabinet adapter in order to supply power to your board. At this point, we could call the project complete if we didn’t mind having an extra power cord coming out of the cabinet. We, however, prefer to have one plug and one power switch on every game that we own. 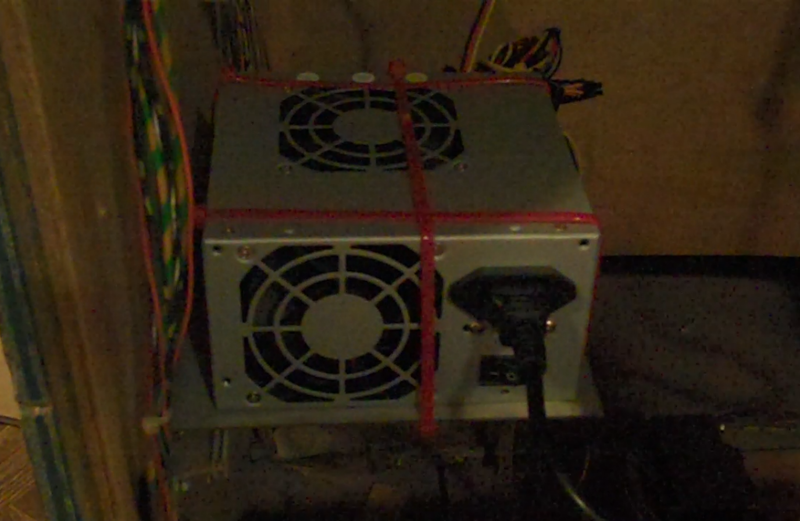 Instead of hanging the extra power cord outside of the cabinet, we located the wires going up to the marquee light and noticed that they were putting out 120 VAC which is the same voltage our ATX power supply requires. We immediately cut off the power plug from the cord coming from the ATX power supply and cut the wires going to the marquee light. Then we stripped the individual wires (AC Line, AC Neutral and Ground) and twisted the correct wires together using wire nuts. While we usually recommend more permanent solutions for attaching wires together, there may come a point in the future when we want to remove this ATX power supply and turn it back into a Ms. Pac Man. Once the wire nuts have been installed, we have finished our multicade upgrade kit. Just as a quick note, you might be wondering how you are going to play games on your 60-in-1 classic vertical board that require multiple buttons such as Galaga or Qix. 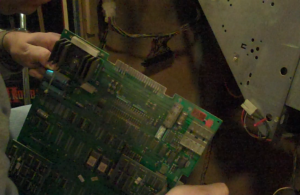 The JAMMA PCB to Pac Man/Ms. Pac Man cabinet adapter actually maps buttons 1 and 2 to the player 1 and 2 start buttons respectively. For example, you can use the player 1 start button to start your Galaga game from the menu and then use the same button to fire once you are in the game. This is a nice feature because it prevents you from having to drill into your control panel which also allows you to keep your Pac Man/Ms. Pac Man cabinet in it’s original form. Installing a multicade upgrade kit is a very appealing option for many arcade cabinet owners as it gives you the flexibility of playing multiple games in a single cabinet. While the multicade conversion process is usually quite difficult, the Pacman/Ms Pacman Upright Cabinet 60-in-1 Upgrade Complete Kit makes the process a breeze while keeping your cabinet mostly intact. Don’t forget to visit JammaBoards.com for more information on this kit. Please leave any questions or suggestions in the comments section below. I followed your instructions and install went well. Thank you! Question though, how can I configure the 60 in 1 settings? Unfortunately I don’t have a test switch / coin harness for my Ms Pac, and seems that this may be needed to config the board? I haven’t been able to set free play, configure volume, etc. Any tips? This is my first arcade restoration project, so apologies if this is obvious to all and I’m just missing it! Never mind! DIP4 on the 60 in 1 puts the card in test mode. Thanks again for a good tutorial.